When I want to treat myself with a really nice dress, I go to Lazy Eye showroom, which is situated just a few steps from Náměstí Míru. 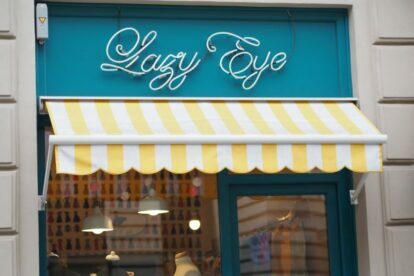 The brand Lazy Eye was founded in 2012 and has become quite popular since then. The brand concentrates on the 50s (and also 40s) fashion style and all the dresses are made based on authentic patterns from that time. Imagine a feminine silhouette with an accentuated waist, ruffled petticoats, thin leather belts, fine fabrics and original design. Besides lovely dresses, you can also find retro bathing suits (made upon request), skirts and accessories as belts, high heels shoes etc. What I also like is the fact that each dress is practically a unique design, so you won’t meet the half of Prague in it :-). Usually there is only one piece in each size (S, M, L) made for one particular dress. The prices are of course not the lowest ones, but you pay for the original design and quality. And yes, from time to time, they have sales too – right now, there are sales up to 50% from the older collections, so hurry up to get yours dress too :-).